When Salan Bage, 61, visited the OCL Eye Centre in Rajgangpur, Odisha for the first time, he was depressed and worried about his family's future. He owned a petty shop, was the sole earner for his family, but had developed optic atrophy (damage of optic nerves), which had resulted in irreversible vision loss. 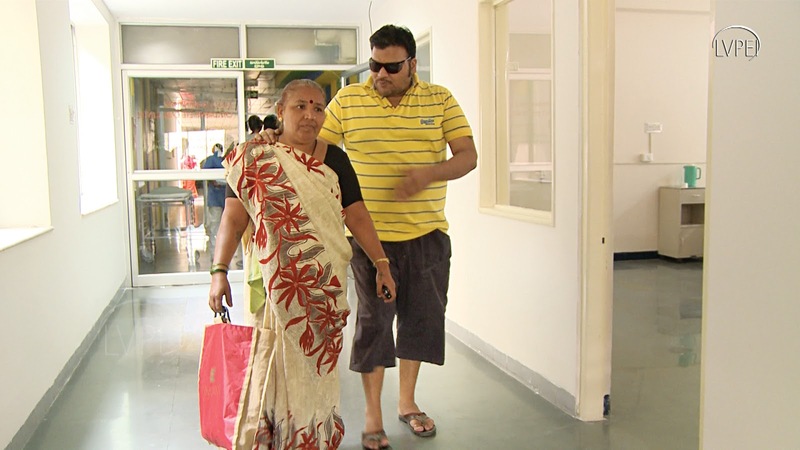 Following a detailed eye examination, he was referred to the vision rehabilitation department at the centre. There he received training on daily living, mobility skills, and on how to use the money identifier. Thanks to this training, he is once again able to work in his shop along with his son. 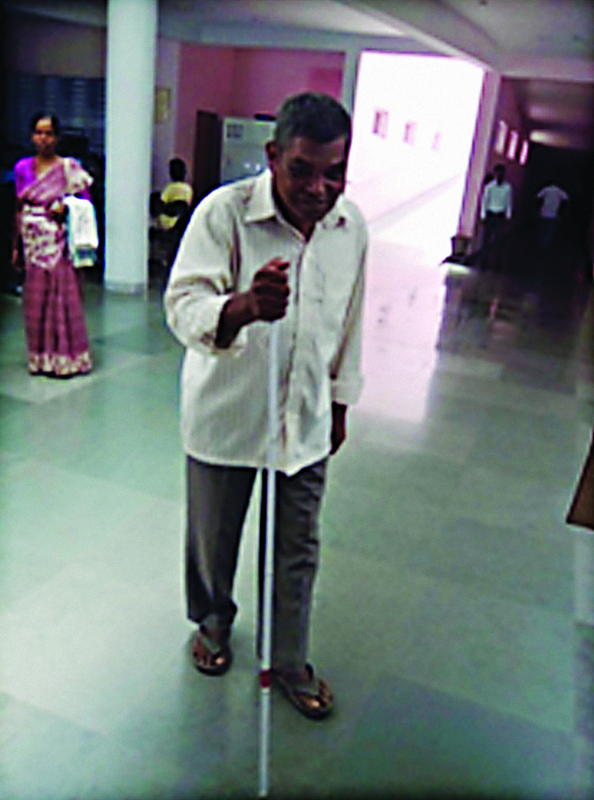 Confident of moving around independently with the help of his white cane, he came to the centre all by himself during his last follow-up visit. His regained confidence has also restored happiness in his life. 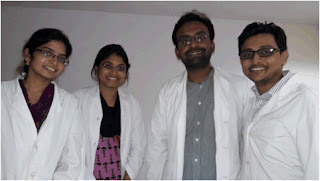 Dr Mayank Mahajan from Agra is currently one of the two fellow doctors posted at the Kuchakulla Ramachandra Reddy Eye Centre, Thoodukurty, Nagarkurnool district, Telangana. His most memorable experience at the centre thus far: “I operated a deaf and mute lady who had bilateral dense cataract, hampering her vision in both the eyes. It was very difficult to make her understand that she will be undergoing a surgery - gesticulation was the only way possible! The surgery was uneventful and the patient was discharged the next day. After a week, the patient was examined for routine follow-up. She shook my hand and tears poured out from her eyes, probably the only way for her to express happiness. It was indeed an unforgettable handshake!" Baby of Jaya and Sumith was born with severe corneal opacity with very small eyes (a corneal condition called sclerocornea with micropthalmos). She underwent cornea transplant at the tender age of 3 months. The surgery was done by Dr Sunita Chaurasia. Their shy baby girl is now 5 years old and can see very well. She goes to school and is able to manage her routine independently. Le Gia Quoc Anh, 16, hailing from Vietnam, started using contact lenses a year back to treat myopia. Initially, the lenses suited him good, but then suddenly after three months, he developed red eye. He was diagnosed with corneal ulcer and was given antibiotics. But the ulcer left behind a corneal scar in his right eye. Eventually, he complained of blurred vision and was advised to undergo a corneal transplant. Vietnam has very few Eye Banks and majorly imports corneal tissues from USA for performing corneal transplants. As a result the waiting period for these surgeries is approximately 3 weeks. 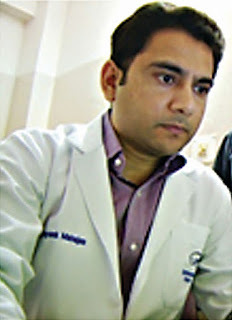 His mother’s friend, Dr Kahn, who is also their ophthalmologist, had done her cornea fellowship at LVPEI in 2007-8. At this juncture, taking into consideration the severity of the problem and the young age of Le Gia, they wanted only the best treatment for him. Dr Kahn had high regard for the specialized doctors at TKCI, LVPEI and strongly recommended consulting them. Their first visit to the institute was on 4 October 2016. After performing a detailed examination, a lamellar corneal transplant surgery has been planned under the skillful hands of Dr Prashant Garg. Le Gia will be undergoing a DALK (Deep Anterior Lamellar Keratoplasty) surgery as this will minimize the post surgery complications. TKCI is one of the few centres in the world to have the expertise of performing DALK surgery. 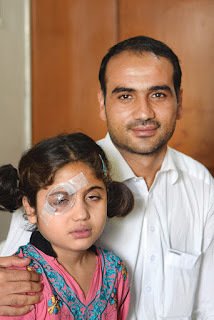 The family is hopeful that the surgery will be a success and Le Gia will be able to see like before. Little Najia Safi, 9, from Afghanistan, wants to one day become a journalist, just like her father. On 5 October 2016, Dr Pravin Krishna Vaddavalli performed a corneal transplant on her right eye. Experiencing blurred vision earlier, she can now see clearly from her right eye. Extremely fond of reading, even as we were interacting with her father, she was engrossed in going through the informative brochures that were handed over to them along with the patient file. 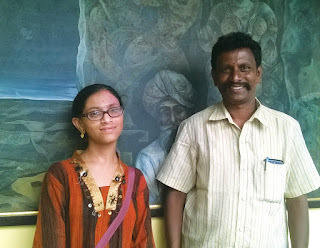 She is a brilliant student academically and her father is now happy that she will now be able to continue her studies. When Najia was very young, she would constantly rub her eyes. The doctors there diagnosed it as a simple allergy, as her father also had the same problem. But the warning bells started ringing when one day she complained to her father that she was not able to copy the notes from the blackboard. Also they noticed that her left eye was turning gray and the eyeball looked protruded. Owing to the lack of advanced medical technology in their country to treat such eye disorders, they were advised to consult the specialists in India. “I extensively researched about the various eye hospitals and was happy with what I read about TKCI at LVPEI. Despite the fact that Delhi would have been more economical for us, I decided to bring her to LVPEI in Hyderabad,” says her father, Mohd Safar Safi. Najia will also be undergoing a surgery in her left eye after a few months. “Our entire experience has been amazing. We will forever remember the affection that Dr Pravin has shown towards our little girl. Undoubtedly, he has now has become her favorite doctor,” says the delighted father. My son Jai was born in November 2015 in Delhi with left eye corneal opacity. A doctor referred us to LVPEI Hyderabad for a corneal transplant, the best place for small kids according to him. At our first visit with Dr Pravin V Krishna, after a long day of tests, he told us that the chances were quite few in this particular case. Jai was having cold and cough so we returned to Delhi feeling hopeless. After a month, we went back for more tests and finally God listened to our prayers. All tests were clear and Dr Muralidhar Ramappa did the surgery in May 2016. He's the best doctor we have ever met - so polite, so gentle. Till date we have travelled to Hyderabad seven times and he has always helped in every possible way. The staff is very friendly and committed. The huge hospital is well maintained in terms of cleanliness and hygiene. I'm also thankful to people who donate corneas. Because of them, Jai didn't have to wait for his surgery. Now he can see through both his eyes. 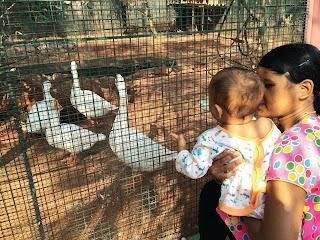 I would advise parents to choose the best for their child - LVPEI Hyderabad. We don't need to tell them kids are a priority because they know it all. They have a separate level designed especially for kids. You can see kids from different parts of the world waiting here. Thank you Dr Muralidhar Ramappa and LVPEI Hyderabad. Keep spreading smiles like this. 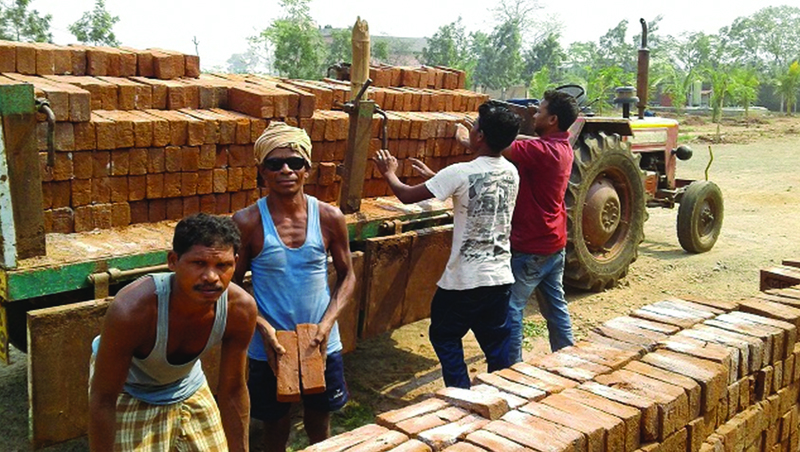 Shyam, 51, from Bishnuguda village in Rayagada district, Odisha, is a daily wage labourer earning Rs 200 a day. Some years back, owing to decreased vision, he had to give up work and was confined to the house. An LVPEI staff member of Nariandas and Morbai Budhrani Eye Centre advised a check-up. 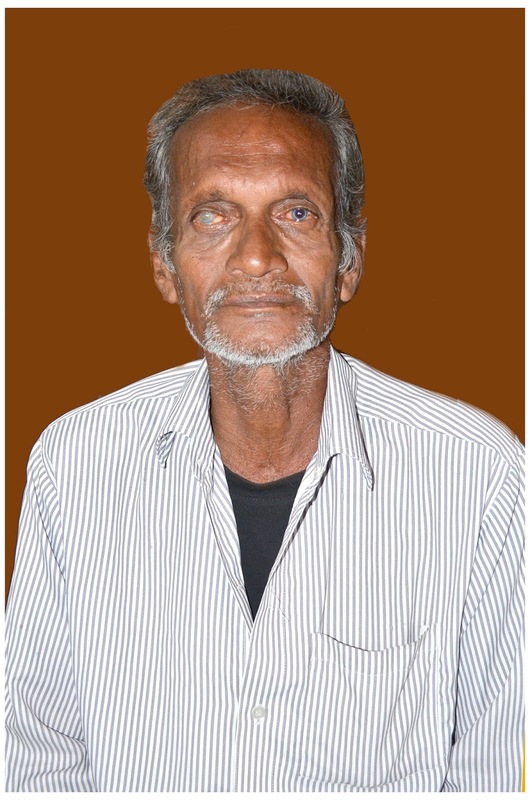 He was diagnosed with cataract in both eyes by Dr Suchismitha Mishra and underwent surgery. Shyam now lives a happy and independent life. Wanishree, 39, from Nimapara in Puri distirct, Odisha, had an outward squint and was subject to ridicule. Unaware that this could be treated, she accepted it as fate. Things changed when her son joined MBBS. On his advice, she visited the strabismus clinic at LVPEI Bhubaneswar and was treated by Dr Vivek Warkad. 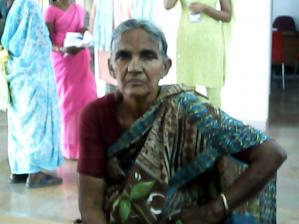 Her squint corrected, she now strives to create awareness among other patients in her local community. 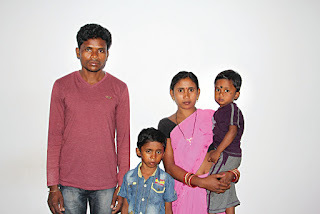 "My son had black spots in his eyes since the age of two"
"I am an agricultural labourer from Santhapalem village, Kothavalasa mandal, Vizianagaram district. My son, Malluvalasa Pavan Kumar, had black spots in his eyes since the age of two, and his eyelashes were so small that he could not open his eyes easily. The government hospital we consulted referred us to LVPEI in Visakhapatnam. Initially when we came here in 2007, we paid for the check-up and were advised multiple surgeries. Unable to bear the cost of the surgeries, I explained about my financial condition to my consulting doctor. Our request was considered and my son was provided the complete treatment free of cost. Gradually, my son's vision improved, and he is now able to study well and carry out all his work independently. 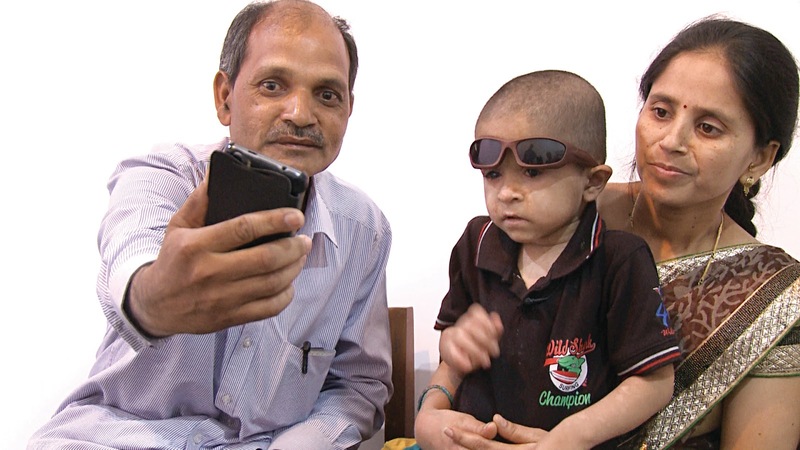 Initially we thought that he will never be able to see, but thanks to LVPEI and the doctors for making this possible." Arham Jain, 7, like any other child of his age, is very active and precocious. He was just 9 months old when his parents noticed that his eyeballs appeared crossed and he would constantly tilt his head to adjust his vision. The local doctors in their hometown Kekri, Rajasthan, were unable to manage the problem and suggested LVPEI Hyderabad where he was diagnosed with squint in both eyes. Within two days of his first consultation at LVPEI, a surgery was performed on 1 July 2016. “Dr Ramesh Kekunnaya explained in detail about the procedure and assured us that post the surgery at least 60% of the squint will be cured. But to our utter delight, under his skillful hands the surgery was 95% successful. Arham has even stopped tilting his head now. 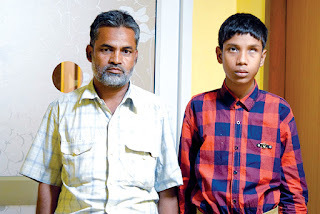 Thanks to Dr Kekunnaya, my son won’t be ridiculed by his friends now!” says Arham’s father Pramod Jain. Young Ankam Madhuri, 9, was lying down and watching TV at night, when her 2 year old cousin accidentally injured Madhuri’s right eye with a pen. 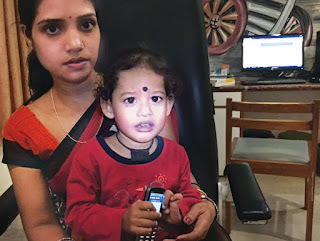 The very next day, she was brought to the Kapileswarapuram Vision Centre in East Godavari District, Andhra Pradesh where Uday Kiran, the vision technician, noticed her prolapsed iris - a condition that needed immediate medical and surgical intervention - and referred her to LVPEI’s advanced care centre. Madhuri had lost her mother a year back and her father was bedridden. Her village Kulla was 10 kilometers away from Kapileswarapuram. Bringing her to Hyderabad for treatment was difficult for her uncle but the project coordinator Madhava Krishna coordinated their visit. The Corneal team at Hyderabad led by Dr Pravin Krishna operated on her cornea to treat the injury and restore its original shape. Madhuri is now happily going to school. “We are amazed with the results of the surgery and timely treatment given completely free of cost to someone from a remote village like ours,” says her uncle Gopati Sundar Rao. How a diligent doctor slayed the swamp monster! When Shraddha Sharma, a worried 34 year old mother of two little children came to the emergency clinic on the 8 April 2016 for the treatment of a corneal infection, she had already been told that her eye will need to be removed due to a severe infection. She had been on treatment of this condition for 2 months and had undergone a therapeutic corneal transplant to get rid of the infection a fortnight ago in Indore. However the infection just refused to go away and had recurred with renewed vigour in the new graft too. When we saw her, she had a a total corneal infection that had even begun to spread to the white part of the eye - the sclera. Diagnostics done at the microbiology lab revealed that she had an infection with a deadly organism called Pythium insidiosum and we knew we were in for a battle as all previous patients with a recurrent infection with this organism, also called the “Swamp Monster” had lost their eye. Till recently this organism, which causes infection in horses was treated as a fungus and with traditional therapy. This was when Alisha Desai, a young Cornea fellow decided to spend a night researching this organism and stumbled upon literature from veterinary science that provided a clue! Pythium, traditionally treated as a fungus was not actually a fungus but a primitive organism called a prokaryote and was susceptible to non mainstream drugs like linezolid and azithromycin, which nobody in Ophthalmology, anywhere in the world had thought of before! 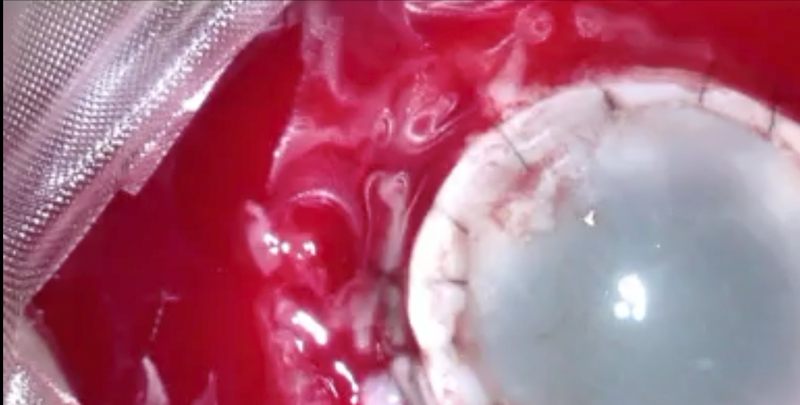 Though there were no reports of these drugs being used for this infection in human eyes, we decided to bite the bullet and along with Jay Chhablani, our retina colleague, operated on the eye for a second repeat transplant and injected the new drugs repeatedly in the eye. Our hypothesis was supported fully by Dr Savitri Sharma, our senior microbiologist, who provided laboratory proof of our new drugs working. Though we kept our fingers crossed, magically Shraddha started to respond and three months after the ordeal made a dramatic recovery and is now completely free of the deadly infection. She has a very good vision now and can finally concentrate on what is really important for her…her children! For Prachi and Naresh, the joy on the arrival of their new born was short lived when their consulting doctor in Nanded, Maharashtra, informed them that the severe redness in both the eyes of the baby was a sign of an infection that needed immediate attention. Heeding to his advice, Ishanvi was brought to LVPEI the very second day of her birth in September 2014. The corneas in both her eyes were already perforated due to Pseudomonas infection– a fatal infection that spreads very rapidly damaging the corneas within few days. Glue plus bandage contact lens was applied to both her eyes to seal the perforation. She was also put on medication to completely curb the infection and then when she was 21-days old, a corneal transplantation was successfully performed in both her eyes by Dr Bhupesh Bagga. When she turned one, she developed symptoms of dryness in her eyes. 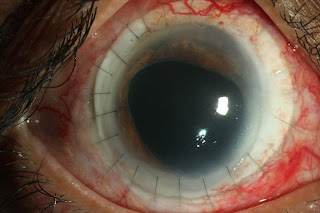 Tarsorrhaphy - a surgical procedure in which the eyelids are partially sewn together to narrow the opening and thus prevent the cornea from any further dryness an trauma was performed. Ishanvi will soon be three and her parents are very satisfied with the treatment that she received at TKCI LVPEI. “Thanks to her treating doctor and the timely treatment, she can today walk around independently, identify colours and is as active as any other child of her age” said the proud parents during their recent follow up visit to the institute. Once she becomes a little older, the stitches on her eyelids will be removed and she will be prescribed glasses which her parents and doctors hope, will rectify her vision completely. 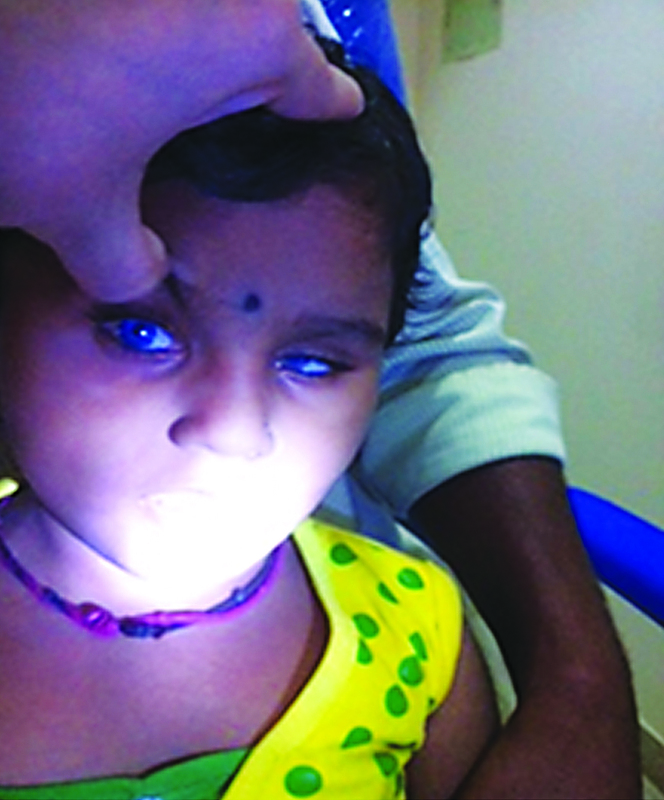 When the parents of little Sravani Marlapati, 7, hailing from Cherla in Khammam District, Telangana State, noticed a white layer in her left eye post an injury in April 2016 they immediately rushed to the LVPEI’s nearest secondary eye care centre in Paloncha, Khammam District – Nava Bharat Eye Centre. She was seen there by Dr Gurcharan Singh, the reporting doctor who diagnosed it as fungal infection of the cornea. 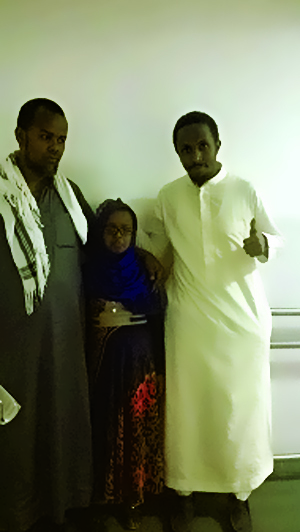 Under the abled supervision of our doctors at Paloncha, the infection resolved over the next 4 weeks. However it left behind a significant corneal scar that obstructed her vision. Dr Gurcharan Singh then decided to consult Dr Mukesh Taneja, one of the TKCI Cornea Specialists at KAR Campus, Hyderabad for further evaluation and management of the scar. With the help of the tele-ophthalmic robotic slit lamp - developed in-house, Dr Taneja sitting in Hyderabad performed a detailed slit lamp examination on Sravani who was there in the Paloncha Centre. Dr Taneja diagnosed this to be an anterior stromal scar and advised for Deep Anterior Lamellar Keratoplast (DALK) surgery. The surgery was performed on 27 May 2016. Post the surgery, all the follow up examinations are being performed through the tele ophthalmic slit lamp. With timely treatment, the corneal scar has been treated successfully, saving Sravani’s eye from going into amblyopia. Thanks to the Tele-ophthalmic slit lamp her parents do not have to travel to Hyderabad for frequent post-op examinations. This surely has saved the family the trouble of frequent visits and the travel expenses that they would have incurred there by. Our daughter S Sai Sumedha, born in November 2000, seemed to be perfectly normal with all her milestones reached before time. 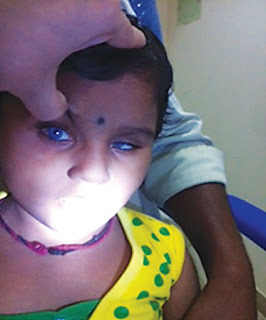 At 6 months of age, a routine check-up by an ophthalmologist at Bijainagar, Ajmer district in Rajasthan, revealed congenital cataract in her right eye. He suggested surgery at age 3, and said vision may not be restored due to atrophy. We brought her to LVPEI Hyderabad where it was diagnosed as PHPV Cataract, requiring surgery to be done within 2nd month of birth. Our daughter was 7 months then but we took our chance. Lensectomy was conducted and we were assured of 80% vision restoration as the central part of the retina i.e. macula was not damaged. It was happy news for us. Then began the most difficult part of parenting. We were advised to use contact lens in the right eye and do “patching” for the left eye for 50% of the waking hours of the baby, on a daily basis. Spectacles were prescribed for the left eye for myopia. We complied. At age 2.5, she underwent surgery for squint. We put her in school and continued with the advice on patching and contact lens, later going to LVPEI Visakhapatnam for follow-up under Dr Merle Fernandes and Optometrist Rekha. At age 8.5 years, Dr Virender Sachdeva operated her to implant a lens. She later underwent squint surgery too and is now being treated for secondary glaucoma. All through, we brought her up like a normal child, but what she has achieved is extraordinary; she has recently scored a perfect 10 CGPA in her 10th Grade! We feel indebted to the doctors and optometrists at LVPEI, especially to Dr Virender Sachdeva for responding to all our queries and worries even after his office hours. 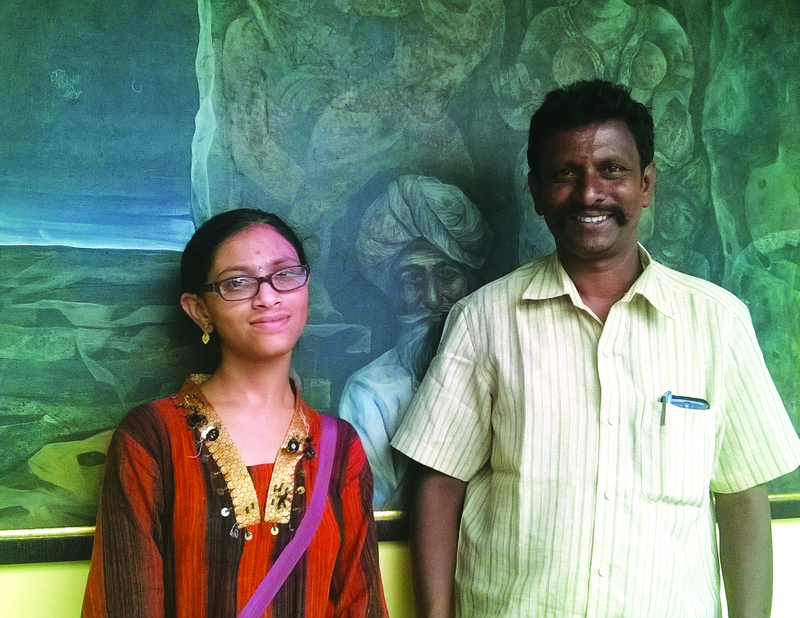 Pragati Gamkar, 16, from Bangalore, is a confident young girl. With vision only in one eye, she has been a patient at LVPEI for the last 13 years. At age 3, her right eye had begun bulging, with a trivial injury blinding it, leaving her with a prosthetic eye. A year later, she experienced decreased vision in the other eye. Unsatisfactory local treatment had the worried parents bring her to LVPEI Hyderabad, where she was diagnosed with 'Keratoglobus' - a rare genetic condition where progressive bulging of the cornea leads to poor vision that cannot be corrected with glasses and also leaves the cornea vulnerable to rupture even with the slightest of injury. 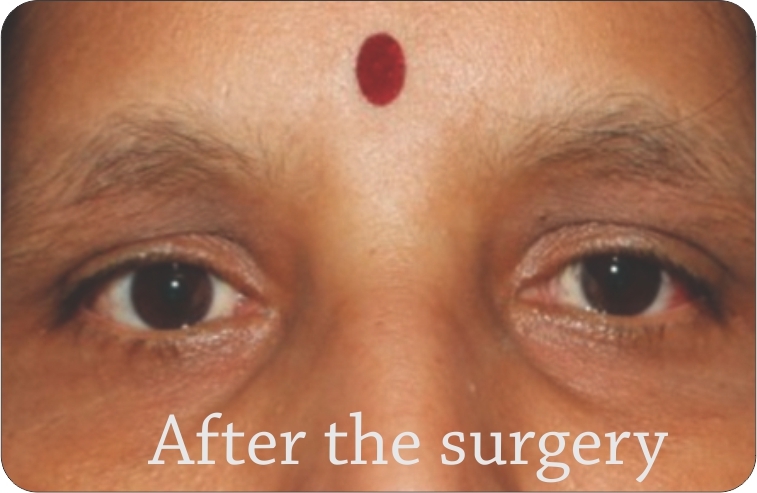 She underwent a corneal transplant in 2004, followed by a cataract surgery, and is now on follow-up care. “I am thankful to the Institute and especially to Dr Somasheila Murthy for saving my daughter from becoming completely blind,” says the grateful father, Mr Krishna Reddy. 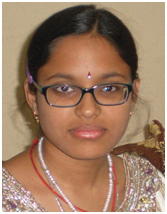 Pragathi, for her part, has scored 92 % in her 10th Grade examinations and is inspired to become a doctor. Spurred by an article by Dr Subhadra Jalali on timely checkup in 20-30 days of birth for Retinopathy of Prematurity (ROP), baby Abdullah's family rushed the two-month old infant to LVPEI. 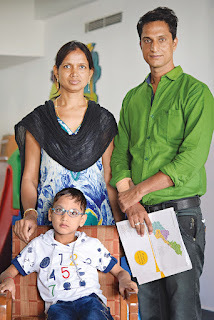 He was born premature with a birth weight of just 800 gm. Retinal examination revealed bleeding inside the eyes along with retinal detachment. His left eye was in an advanced condition but there was slim hope of restoring vision in the right eye. Multiple laser surgeries later, for the extremely challenging case of “Stage 4A Plus ROP”, Abdullah's visual acuity improved to 20/125 with the help of glasses that he began using from age 5 months. Along with the expert medical treatment for ROP, the institute's Vision Rehabilitation team provided him with early intervention services to avoid developmental delay. They also pitched in with facilitating his admission to a mainstream school, training on using the telescope, magnifiers and voice activated aids for pursuing his academics. 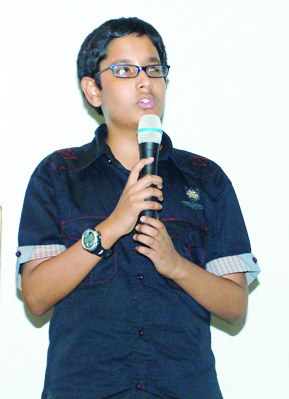 Sure enough, Abdullah Abdul Karim has repaid his doctors, parents and teachers by making them extremely proud. He scored a spectacular 97% in his 12th Grade (science stream) examinations, making him the topper for P Obul Reddy Public School! 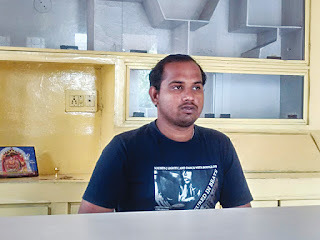 Akhil, 20, a college student from Vuyuru, Krishna District, Andhra Pradesh, came for a general check up two years ago to LVPEI’s KVC Campus, Vijayawada. He was diagnosed with keratoconus in both his eyes - a condition affecting youngsters with a progressive bending and irregular protrusion of the cornea. It can only be treated with the use of special contact lenses, and in cases where the condition worsens; a surgery needs to be performed. Mr Satish Mogili, Contact Lens Consultant, prescribed him with special contact lenses to restore his vision. Vision in his right eye continued to deteriorate and a surgery was performed to slow down the progression of his eye condition. This involved detailed follow-up and repeated trial sessions for special contact lenses. The family today is overjoyed with the results. With vision restored in both his eyes, his mother is happy that now he will no longer have to wear spectacles that are cosmetically not very appealing. Gaddula Achanna, 70, a farmer and father of five daughters is from a remote village in Chagulla district, West Godavari, Andhra Pradesh. He had developed a small, gradually progressing, white nodule on his right eye. Poverty and geographical remoteness delayed the seeking of care. When the right eye mass became huge and started protruding out of his eye, causing pain and discharge, he went to Smt Rajeswari Ramakrishnan Lions Eye Hospital at Nidadavole who referred him to LVPEI Vijayawada where Dr Anasua Ganguly diagnosed ocular surface tumor that had spread into the orbit. Orbital exenteration surgery was done to remove the entire tumor to save his life. A complete systemic screening ruled out spread of the tumor to his body. Finally on histopathology it turned out to be a rare case of mucoepidermoid carcinoma conjunctiva spreading to the orbit. The old man was awestruck to have got back a new lease of life. 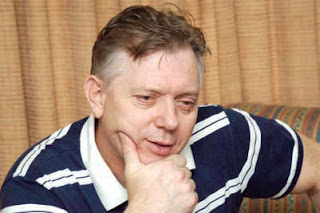 He was immensely grateful to LVPEI’s “God-like” doctor and staff for alleviating his guilt of having his daughters pitch in to earn for the family. “A little accident caused a glass piece of my spectacles to pierce my eye. After that I could not see. The pain was terrible. A local hospital could not help. 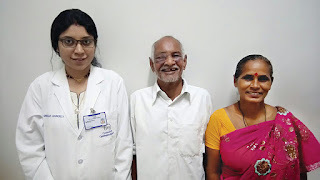 But in the five months that I have been treated at LVPEI Vijayawada, I have undergone two surgeries under Dr Vishal Rawal and have miraculously regained my lost vision!” says Mopidevi Veera Venkata Suryanarayana of Tanuku, Andhra Pradesh. Suryanarayana runs a transport company, which he now manages with the support of his wife and three children. 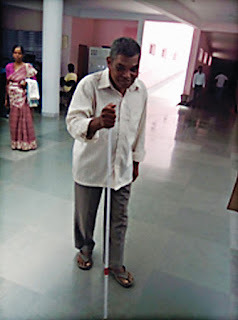 With Dispelling the darkness for Suryanarayana the depression of vision loss due to a damaged retina now firmly behind him, he looks forward to an active life and remains grateful to Dr Rawal and LVPEI. crashing down, severely injuring her right eye. Emergency care with the pediatrician stemmed the bleeding and pain but she eventually developed vision loss that thwarted her progress in school. Worry about turning blind completely caused the family to try many hospitals in Hyderabad but the prohibitive fee was a deterrent. Someone recommended LVPEI where Dr Raja Narayanan diagnosed retinal detachment for which she underwent vitrectomy with silicone oil injection in October 2015. Today, Ghousial has miraculously regained 60% of her vision. Her mother, a teacher and a single parent, and her uncle Mohd Quaneruddin, are hopeful of further progress once the silicone oil is removed from the eye. She is grateful to the treating doctor and to LVPEI for providing the treatment at an affordable cost. 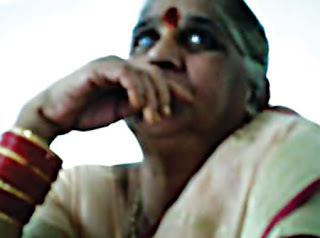 Shaik Bibi, 65, a mother of four from Tenali, came to LVPEI’s Secondary Centre in Sattenapalli with diminishing vision in her left eye after a cataract surgery 6 months ago. 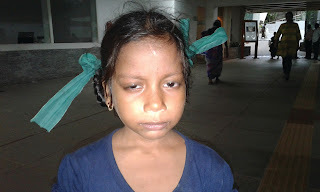 She was diagnosed with left eye Pseudophakic Bullous Keratopathy. She was further referred to KAR campus, Hyderabad for left eye corneal transplant procedure - DSEK - under local anaesthesia. She expressed reluctance to travel as she was dependent on her children and was living off her meagre pension money. "Hence, we decided that if the patient cannot access the benefits of the available facilities for corneal transplantation, the facilities can be brought to her," said Dr Pravin K Vaddvalli. Sight restoring corneal transplantation surgery is traditionally done in advanced surgical centres, mainly located in large cities. This makes it hard for patients from the remote rural interiors to travel to the cities and stay for the duration required. 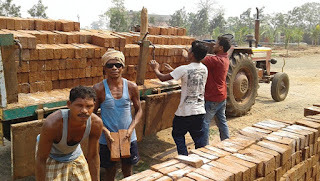 Often, it is economically a double whammy for them as they have to not only summon the financial resources for travel, stay and treatment, but also forego their daily wages as agriculture labourers, as also the wages of the person accompanying them. So LVPEI created history by conducting a Corneal Transplantation surgery – a complex eye surgery – at its secondary eye care centre, the Edward and Soona Brown Eye Centre, at Dhulipalla village in Sattenapalli Mandal, Guntur District, Andhra Pradesh on 28 March 2016. The centre’s first ever corneal transplantation was performed on Shaik Bibi by the surgical team of expert doctors from the Tej Kohli Cornea Institute of LVPEI and the ophthalmologist in Dhulipalla centre. The corneal donor tissue for the procedure was carefully transported from LVPEI’s Ramayamma International Eye Bank in Hyderabad. The doctors stationed at Dhulipalla have been trained to take care of post operative care of corneal transplant patients. Thus the patient need not travel anywhere else at all. What’s more, the patient could even return home the same day after the transplant, thus saving time and resources for her family. This secondary centre which was established in January 2015 is already providing high quality comprehensive eye care services to individuals with diabetic retinopathy, glaucoma and children with eye problems. In Kamalapuram village of Krishna district in Andhra Pradesh lives 24 year old Thenneru Rajesh; who on the one hand, has to deal with a problematic skin disease and on the other hand, deals with loss of vision. Born with a skin disease called Xeroderma pigmentosa, his skin had become thickened and marbled and he could not bear to go out even in mild sunlight. 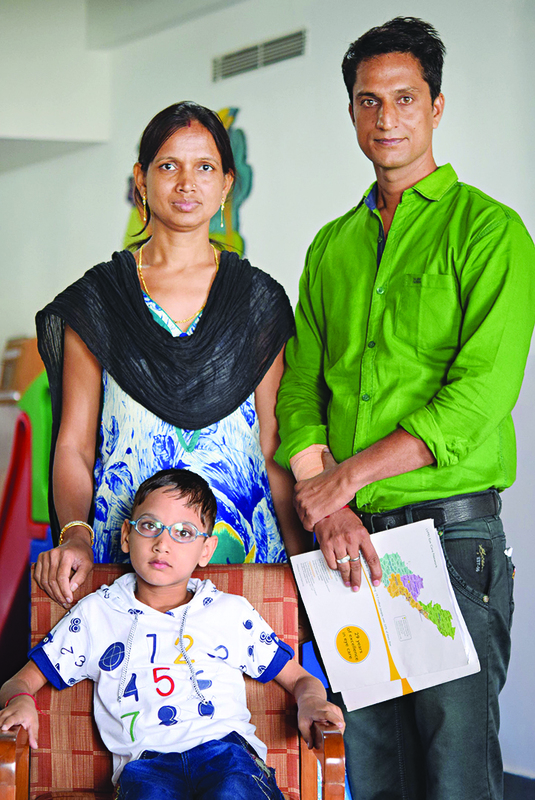 Rajesh, an unfortunate victim of this intractable genetic disease, had to forego schooling. His father Aandaala Rao, helpless seeing the plight of his son, tried all the available remedies that was suggested to him including local herbal remedies. 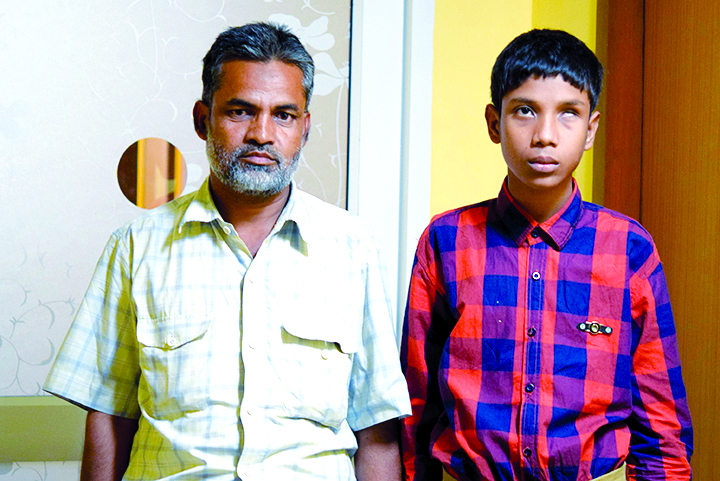 Aandaala Rao had to face many financial hardships for his son’s treatment. However Rajesh’s condition worsened and he lost his vision in the interim. Rajesh found it difficult to even work in the fields along with his father because of his vision. Just as life’s troubles were becoming unbearable for Rajesh, help arrived. A relative working in a private hospital in Vijayawada came to know of LVPEI’s Kode Venkatadri Chowdary campus and advised him to consult the eye specialists there. Dr Mahesh Kalyankar, who first examined Rajesh in November 2014, vowed to restore at least some of the vision that Rajesh had lost. After a corneal transplantation in his right eye, Rajesh’s joy knew no bounds. He got back some of his lost vision. His father takes a lot of pride in watching over Rajesh as he is being prepared for his left eye surgery soon. Bobbili Sanyasirao was working in a small hotel in Chodavarm village, Visakhapatnam, Andha Pradesh on daily wages. One day he accidentally hurt his eyes and it resulted in severe redness and swelling. The local chemist prescribed some eye drops. Rather than doing any good, the drops aggravated the problem. His vision reduced and his cornea started turning white. 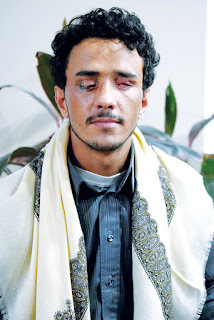 He underwent a surgery performed by a local ophthalmologist, but the results were not positive. In 2015, he experienced vision loss in his left eye as well. He was then advised to visit LVPEI’s GMRV Campus in Visakhapatnam. 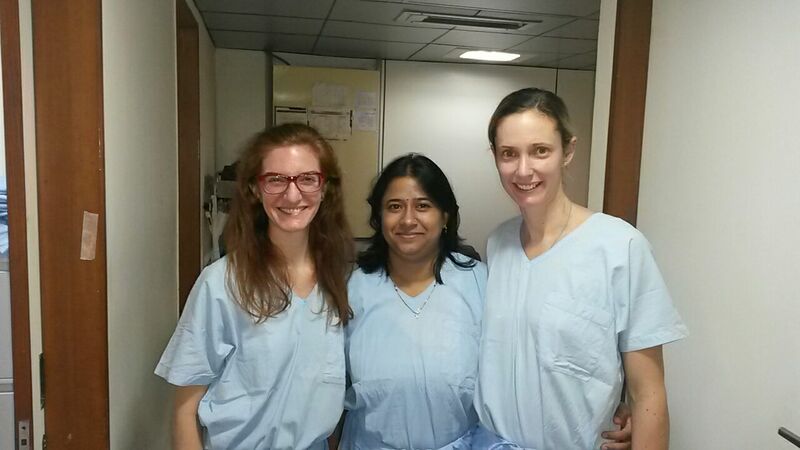 A corneal transplantation surgery was performed by Dr Merle Fernandes. “I will be forever indebted to LVPEI for giving me back my vision and my financial independence. 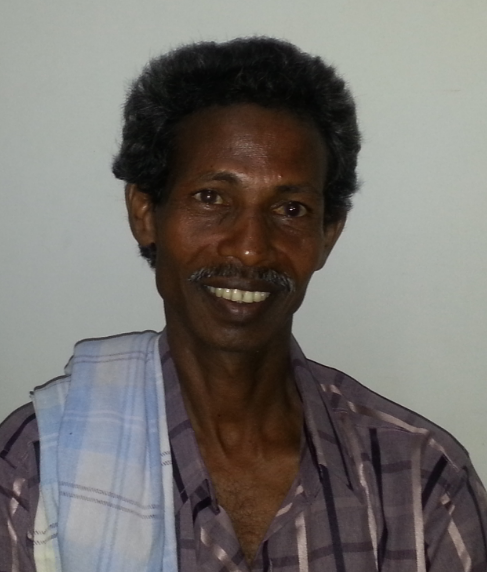 My vision has improved drastically and I have now started my own flower shop” says Bobbili. Konala Bhaskar Rao, 41, agricultural labourer from a remote village of Kapileswarapuram on the banks of the Godavari, Andhra Pradesh sustained injuries in his left eye while working in his field. 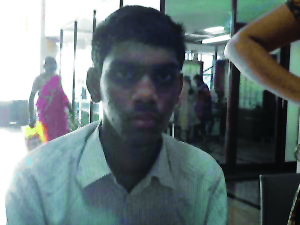 This resulted in corneal ulcer for which he underwent a corneal transplantation at LVPEI’s KVC Campus, Vijayawada. 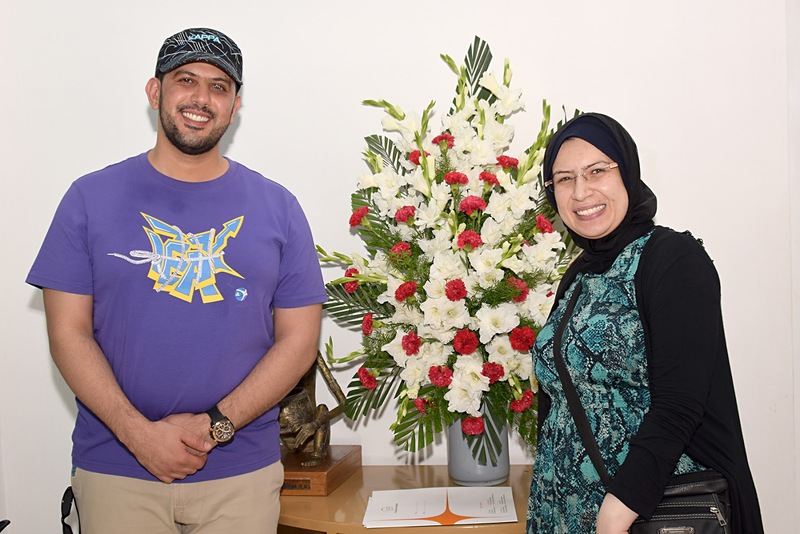 Despite the day-to-day difficulties he faced in carrying out his daily work, and travelling 250 kilometers for the frequent follow up visits to the hospital and the medication, he and his family bravely overcame all the challenges that a patient of corneal transplantation faces. When he was indisposed, his wife took charge of taking care of the family. 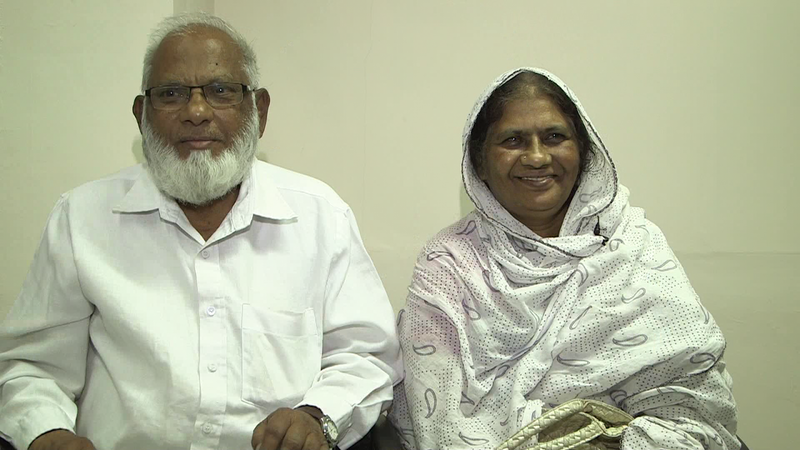 With regular checkups and nearly 20 follow up visits spanning over one and half years, difficulties of maintaining a graft and a subsequent cataract surgery, today his vision is completely restored. Now he is able to confidently carry out all his work and take care of his family. 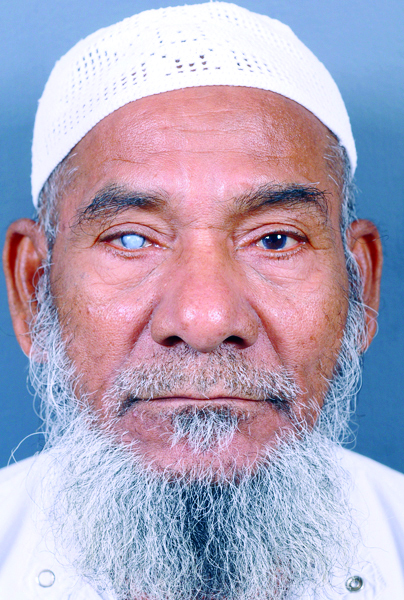 Sheikh Abdul Hameed was compelled to seek voluntary retirement from his job at a dairy factory, owing to his failing vision. After a local doctor in Kurnool referred him to LVPEI, he underwent glaucoma surgery in his left eye that allowed for the restoration of some vision, and diligently sought follow up care with Dr Anil Mandal for nearly a decade. Unfortunately in September 2014, his only seeing eye was hit by a stone as he was watching some children at play. The injury led to infection and cataract (loss of transparency in the eye lens) and he had to be operated upon for cataract removal. Dr Mandal also referred him to Dr Muralidhar Ramappa to see if anything could be done about his right eye that had developed a white opacity for over 10 years. 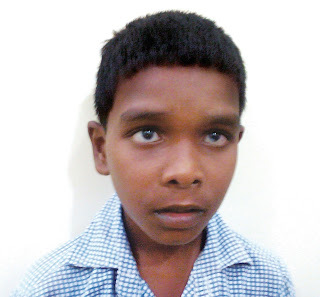 Dr Ramappa performed two surgeries to Hameed’s right eye; corneal replacement and cataract removal respectively. To Hameed and his wife’s sheer delight, vision was indeed restored in his right eye. Hameed is thrilled to be able to lead an independent life in his autumn years, even as he wonders as to his premature decision to seek voluntary retirement, losing 11 earning years! 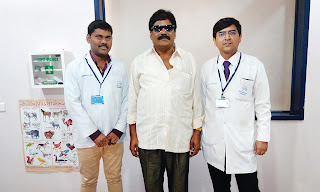 When P Srinivas reached the Edward and Soona Brown Eye Centre in Dhulipalla, Andhra Pradesh on 10 February 2016 at 8:30 pm in the night, his right eye was red in colour, paining and watering. While driving his motorcycle, he had collided with a branch of a tree and had injured his eye. The local doctor had prescribed some drops, but that did not help. A detailed eye examination revealed a corneal tear and the repair surgery was performed the very next day. Srinivas, who is an agriculturist, is very happy and relieved now that the pain and the watering have completely stopped. 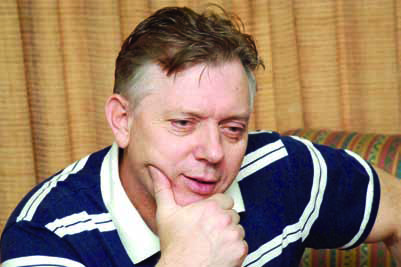 He also underwent a cataract surgery subsequently. “I have full faith in LVPEI. I am fortunate that such a good facility is available so close to my village; else I would have had to struggle with travel expenses to the city,” says Srinivas. An unsuccessful cataract surgery in the right eye three years back, resulted in unbearable pain and vision loss for 55 year old Jahera Bee from Bellary, Karnataka. “The doctors I consulted told me that my case was very complicated and nothing could be done. The only solution was to remove my eye and replace it with a prosthetic eye but I was not convinced and did not heed their advice. My hope was rewarded when I consulted Dr C Jagadesh Reddy at LVPEI. He assured me that the pain would surely go and he would also try to restore my vision, and it did! Now I can see, and move around independently. I strongly recommend LVPEI to others who face a similar problem. I would also like to be associated with LVPEI as a volunteer,” says a grateful Jahera Bee. Jahera Bee had a disorganized anterior segment of the eye with chronic edematous cornea, for which keratoplasty was done in February 2016 by Dr Reddy. Mohammad Bilal a 23 year old student from Hyderabad in Pakistan, was examining an opened inverter with a candle in hand, totally ignorant to the danger involved, when the unforeseen happened. He sustained severe burn injuries in his right eye and was rushed for emergency medical assistance. 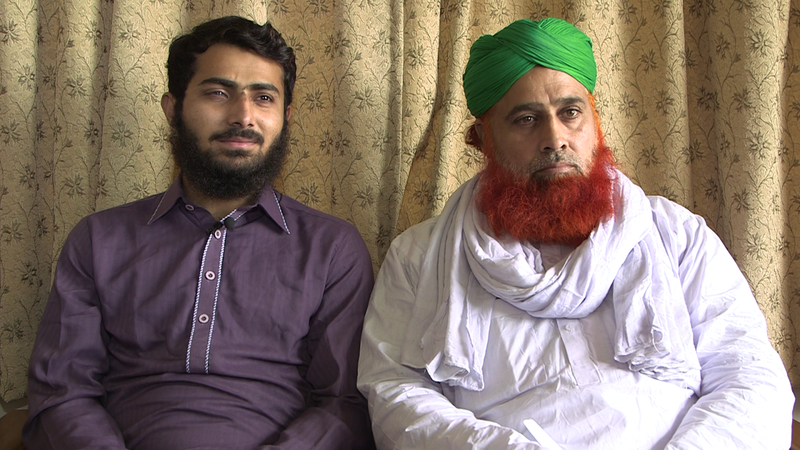 In the hope of receiving the best of medical care, he was brought to Islamabad and then to Karachi. “The doctors I consulted said that 90% of my vision was already lost. The surgery they suggested was very expensive and the chances of success were remote. I posted my case online and received several responses from doctors all over the world. I felt most comfortable interacting with Dr Neera Agarwal in Delhi, India (Neera Agarwal is an Cornea alumnus from LVPEI, trained here more than 20 years ago!) who informed me about limbal stem cell surgery and its success in restoring vision. I came down to India and was operated by her. Post surgery, as she was not very happy with the improvement in my vision, the doctor referred me to Dr Virender S Sangwan at LVPEI, Hyderabad,” recalls Bilal. In early 2015, he underwent another limbal stem cell surgery performed by Dr Sangwan and in February 2016, on a follow up visit, he was delighted that 45% of his vision was restored. Bilal is currently doing his engineering and aspires to do an MBA. “Earlier my eyelids would stick to each other, but now I can open them properly. Though a little apprehensive in the beginning about coming to India, my family and I are now very happy with the quality of service and care we received here,” says the delighted Bilal! From losing his vision at age 6 due to a health issue, being compelled to quit school, to being the only one from Telangana state to be selected by RBI, Kishore Babu, 24, has indeed come a long way. He is now an Assistant with the Reserve Bank of India, Hyderabad, is a positive and engaging young man enthusiastically preparing for internal promotional tests, and is part of a music band that was privileged to have performed in front of the late Dr APJ Abdul Kalam. 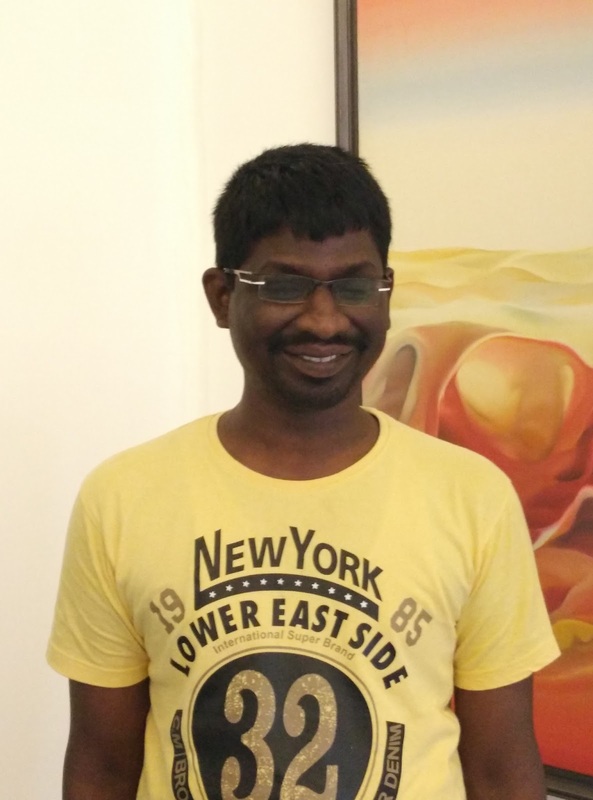 A year after he had to quit school, someone recommended LVPEI's rehabilitation centre where Kishore recalls learning “a lot - from soft skills to technical training - from the dedicated, professional and caring staff”. He even went on to finish his schooling and graduation in B.Com. “We don't need sympathy; we need equal opportunity. At my workplace, I am not treated differently; I am expected to perform on par with my colleagues. Parents of children with vision impairment should not shy from seeking services from centres like LVPEI. Once they visit, they will realize that the sky is the limit for their child,” says Kishore. Krishna, 25, from a humble family in Madhya Pradesh has an MBA in Finance. His preparation for a banking career suffered a blow due to eye injury and subsequent vision loss. Krishna has hemophilia, a rare genetic disorder in which the blood does not clot and results in excessive bleeding. At LVPEI, a team effort by his doctors first focused on controlling his hemophilia before treating him - completely free of cost. From Dr Archana Bhargava's persistent efforts to convince the Delhi Hemophilia Society to provide the expensive Factor VIII injections to Krishna free of cost, to Dr Pavan Karla's diligence in administering these injections twice daily for seven days at 2pm and 2am, and to Dr Bhupesh Bagga's skill in performing the Hyphema drainage surgery early in February, everything went like clockwork. “I came to LVPEI with high expectations and it has lived up to its reputation. The pain has subsided drastically; my vision is still blurred but I have been told further course of treatment will be planned. I am hopeful the doctors save my vision and I can resume my preparation for bank exams,” says a grateful Krishna. Anuradha Mandal, 8, from Kolkata, is a normal, inquisitive child and a source of joy and pride for her parents. “She was not always like this. She was a shy child, prone to anger and irritation. 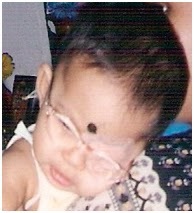 She was a preterm baby with low birth weight and was operated for cataract in both eyes at 6 months of age. Things were not easy for her. She would read and watch TV from up very close, a problem that persisted even after an Intraocular Lens was implanted at age 5. She then developed a squint that doctors in Kolkata said could be operated upon only after she turned 16. Thankfully, her pediatrician recommended LVPEI,” says her mother. In January 2015, at age 7, Anuradha underwent surgery for squint correction under Dr Ramesh Kekunnaya and she is a transformed child now. “Our neighbours and friends tell us they can see a positive change in her now. I would advice other parents who face similar problems to consult at LVPEI without waste of time, no matter which part of the world they need to travel here from!” says the delighted father. My baby was referred to LVPEI for cataract and ROP. My baby was preterm, weighed 800 grams and was under ventilation for 3 months. 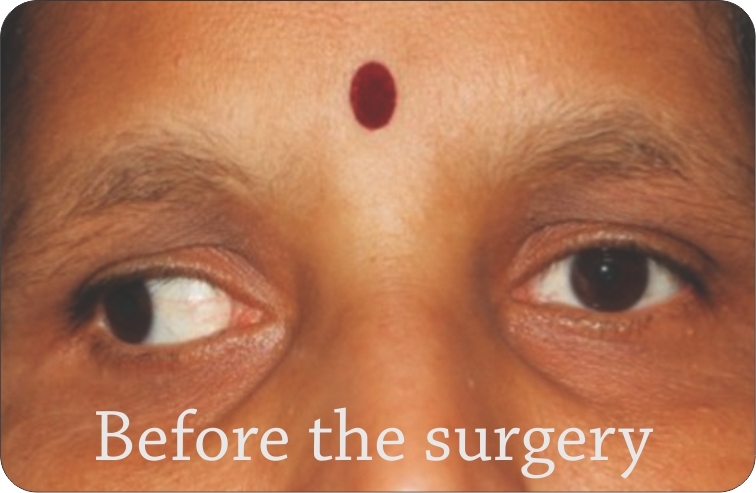 The high ventilation affected her eyes; she was referred to LVPEI for cataract and ROP. Dr Subhadra Jalali at LVPEI Hyderabad treated her with Avastin injections in both eyes, and Dr Virender Sachdeva at LVPEI Visakhapatnam performed cataract surgery. For ROP treatment, Dr Subhadra performed surgery for both the eyes and referred us back to LVPEI Vizag for regular checkup. Our baby is now using contact lenses advised by Optometrist Ramkumar. My baby struggled a lot to regain her vision. Today we are really happy for the services we received from the two LVPEI hospitals in Visakhapatnam and Hyderabad. Our heartfelt thanks to all the doctors, optometrists and patient care staff for their support! “All of us are very happy that we got a glimpse of the LVPEI culture and the extraordinary work that is carried out at LVPEI’s GMRV campus . We are going back with with greater understanding about the various options that we can now explore and a confidence to face the many challenges that our likely to come our way as we proceed in this field. In the limited time that we have spent here, all the various departments have contributed equally to our training and for that a Big Thank You to all of you." Feedback from the postgraduate students of Regional Eye Hospital who completed their one month observership program at GMR Varalakshmi Campus, Visakhapatnam. Ever since she was a little child, growing up in La Plata Buenos Aires, she always wanted to help people to see. After finishing her medical school in Argentina, the dream of becoming an Ophthalmologist appeared close to reality, so Agustina applied, was accepted and finished her Ophthalmology residency program at the Clinica de Ojos in 2014. Of all the subspecialties that she trained in Cornea was always her first love and passion. Now, she is proud to be part of the new Tej Kohli Cornea Institute. The icing on the cake was that Agustina had the privilege of discovering some fantastic new friendships with colleagues and peers, who she says, have became more than family to her. After spending a year In LVPEI with only a few more months left here, she has start thinking about all the possibilities that this fellowship has offered and the opportunities that could open up once she is back home.